Location: Kincardine and Mearns, Aberdeenshire, Scotland. Built: 13th and 17th century. Ownership / Access: House of Burnett. Notes: Muchalls Castle stands overlooking the North Sea in the countryside of Kincardine and Mearns, Aberdeenshire, Scotland. 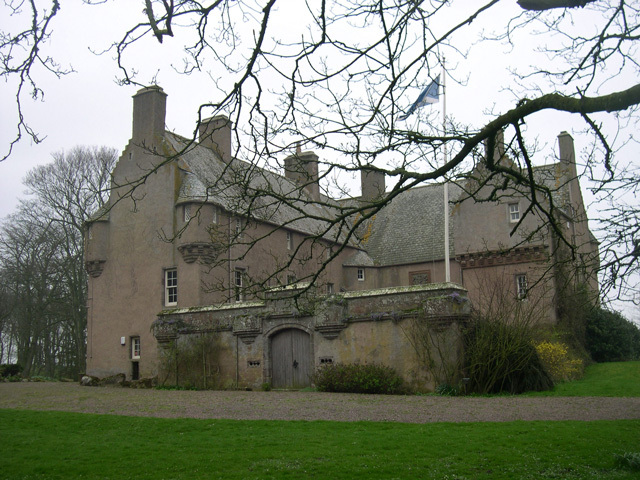 The lower course is a well preserved Romanesque, double-groined 13th century towerhouse structure, built by the Frasers of Muchalls. Upon this structure, the 17th-century castle was begun by Alexander Burnett of Leys and completed by his son, Sir Thomas Burnett, 1st Baronet, in 1627. The Burnetts of Leys built the remaining four storey present day castle. One of the most interesting castles of northeast Scotland, according to noted architectural historian Nigel Tranter, it is designed in the classic L style with a further extension wing at the west end. Muchalls Castle entered national history in 1638 when a seminal Covenanter gathering took place here precedent to the English Civil War. The plasterwork ceilings of the principal drawing rooms are generally regarded as among the three finest examples of plasterwork ceilings in Scotland. These adornments date to 1624 and are in virtually perfect condition. They consist of heraldry of the Burnett of Leys family, along with heraldry of relations and friends intermixed with biblical iconography. The overmantel of the Great Hall fireplace features the arms of King James VI flanked by impressive egyptianesque figures.